Prana - 'life force' in Sanskrit - is a destination where travellers from around the world come for rejuvenating their vitality and life energies. The Spa is located at 7000 feet altitude in Kodaikanal, a small romantic town atop the misty mountains where the climate is ideal for revitalizing your energies with clean air, lush fauna and flora. Kodai Lake is a 60 acres, starshaped, manmade lake. Moving in water across the scenic surroundings of Kodai is a memorable experience. A brisk tour round the lake can take 45 minutes and provides breathtaking views which you will remember for life. The lake provides many activities all through the year, with its green surroundings and a 5 km path around the lake. It has an average depth of 3 m. You have the opportunity to explore the lake on horseback, by bicycle, foot or boat. 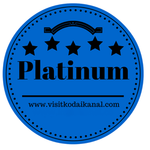 At the Kodaikanal Boat and Rowing Club you can hire a boat and see the lake from the waterside. Rent a bicycle and tour around the lake without harming the green surroundings with diesel fumes. At most of the hill stations in India riding on horseback is a favorite tourist activity. With 40 to 60 rupees, you can have a small trot around the lake. If you are very keen you can hire a horse for yourself and ride around Kodai for a perfect eco-tour. Silver Cascade is a picturesque waterfall on the roadside from Kodai road to Kodaikanal, just 4-5 km before Kodaikanal. The waters that stream directly from the mountains are cold and superb to bathe in. Enjoy the power of nature under the eucalyptus trees. Bryant Park is a must-see. It is close to the lake and located a 10 min walk from the boat club. During the summer you can experience stunning flower shows. The park also functions as a practical center for education on Ornamental Horticulture and as a demonstration center. Berijam lake is beautiful and serene. It is perhaps the most stunning of the 3 lakes in Kodai. There is a limited number of visitors admitted every day to protect the wildlife of the area. Entry permits are issued at the Forestry Department Office in Kodaikanal. The park is home to wild elephants, bison, leopards, wild boars, barking deer and Malabar Giant Squirrels. Here is a beautiful and more quiet park than Bryant Park. It is rich in flowers and artistic shaped hedges and bushes. Enjoy a good time with the family here. It also has swings for the kids. This is a picture perfect opportunity to get a full view of the mountains and valleys. On a clear day you can see the Dolphin's Nose in the south, valley of Pambar river at southeast and even as far as the city of Madurai. On a cloudier day you can watch the clouds form into an ocean below you and you might be fortunate enough to experience the phenomenon of Brocken Spectre, where you can see your own shadow in a cloud with a rainbow halo. If you are an early riser catch the sunrise from here otherwise sunsets are beautiful as well. This fascinating sight is 3 giant granite rocks standing shoulder to shoulder and reaching 122 meters up. Underneath are inviting shady woods. The chambers visible in-between the rocks are known as Devil's kitchen. Devil's Kitchen or Guna Cave in Pillar Rocks has an interesting variety of plants and insects. The caves also have a bat infested chamber. But watch out for these caves with their wobbly and loose rocks. They are very steep and risky to get in. Pine Forest is on the way to Devil's Kitchen. When you get a little deep into the forest you are completely surrounded by long pine trees. Here you will have a great opportunity to take some interesting pictures. Perumal Peak is located 11 km from Kodaikanal. Take the bus to the Perunalay bottom. From there it is a 2 hours hike to the top where you will be rewarded with an unspoilt view of the entire Ghat area. Bear Shola is a superb waterfall close to the city. During some seasons there might not be any water, but climbing up the dry fall is a good hike. Another lovely waterfall in Kodaikanal. Definitely worth a visit! This institution was founded in 1898. It is located at the highest point in Kodai hills at an altitude at 7700 ft. The temple is dedicated to Lord Murunga. In the summer when visibility is good, the view from here is great. The flowers of the kurinji plants inside the temple blossom every 12th year and are a memorable experience. The museum was founded in 1895 and is looked after by the Sacred Heart College. It is a famous tourist destination and is quite educational. Here you can find a variety of specimens of flora and fauna with preserved fossils. There is also an Orchidarium with approximately 300 species of exotic orchid. The recently opened wax museum is located near the green valley. In the mountains about 14 km from Kodaikanal you will find the Kodaikanal Yoga Center surrounded by waterfalls and trees, located in the heart of an ecological farm. The center hosts regular yoga and meditation workshops. Complimenting there are courses and lectures that includes healing art and ecological lifestyle.